The proportion of households where no-one is working has fallen to its lowest level since modern records began in 1996. The Office for National Statistics (ONS) says 14.5% of households in the UK were classified as completely workless in the three months from April to June this year. That meant there were 2,998,000 such homes, containing 4,130,000 people. The government hailed the figures as a triumph for its economic policy. The Work and Pensions Secretary, David Gauke, highlighted some of the new figures which showed that more than two-thirds of lone parents (68%) were in employment, the highest figure on record. "What's particularly great news is that lone parents are more likely to be in work than ever before," he said. "With record levels of employment, more people across the country now have the ability to support themselves and their families. "That means more children growing up with a working adult and more children who can see first-hand the benefits of being in employment," the minister added. The figures are drawn from the regular Labour Force Survey which also provides much of the official unemployment data. The ONS analysis looks only at households where there is at least one person aged between 16 and 64, so homes with only older people in them - aged 65 or over - are excluded. 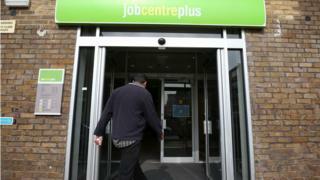 However being in a workless household does not necessarily mean being unemployed. The official definition of being workless also includes those who are judged to be economically inactive, such as students, the retired, carers and the ill or disabled. In fact this economic inactivity, rather than unemployment, is far and away the biggest reason for a household to be deemed entirely workless. By contrast, only 1.4% of all workless households in the UK - 290,000 - are deemed to be so because all their members are unemployed. Back in the April-June quarter of 1996, the proportion of households which were workless was much higher than now at 21%. Since then, that proportion has fallen steadily, with only a slight increase in the figures in aftermath of the sharp recession caused by the great financial crisis of 2008-09. Now, general levels of employment have been at record levels for some time and the official unemployment rate is down to its lowest level since 1975, at 4.4%. As a result, the proportion of households whose members are all working has risen in the past 21 years from 52% to 58%. Margaret Greenwood, Labour's shadow employment minister, said: "While any increases in employment are positive, under this government work is no longer a reliable route out of poverty with over half of those living in poverty coming from a working household."